There are a number of recommendations aimed at promoting good corporate governance. These include, inter alia, that directors should provide more informative narrative reporting in relation to their duties under Section 172 of the Companies Act 2006 including explaining how they have considered each of the different stakeholder interests, such as employees, customers and suppliers and how this has been reflected in the company’s financial decisions; that the Financial Reporting Council (FRC) should work with companies to develop a new corporate governance rating which would publicise ‘examples of good and bad practice in an easy to digest red, yellow and green assessment; companies would be obliged to include reference to this rating in their annual reports’; the Financial Reporting Council should be given additional powers to engage and hold company directors to account in respect of their duties. Enhancing the dialogue between boards and investors is discussed as is the relationship between the board and the company’s stakeholders. A new governance Code should be developed for the largest private companies which are subject to weaker reporting requirements. The new Code should include a complaint mechanism so that any complaints raised about compliance with the Code could be followed up with the individual companies concerned. A simpler pay structure is recommended, the constituents being salary, bonus relating to stretching targets, and payment by means of equity over the long-term. Complex long-term incentive plans which may have unintended consequences would be abolished. An option for employee representation on remuneration committees would be included in the Code, furthermore the Report states that it expects leading companies to adopt this approach. Each of these issues has been discussed in recent blogs. But she also suggested that workers should be appointed to boards of directors. As could be predicted, this suggestion was welcomed by the Trades Union Council but raised alarm in some British boardrooms. ‘In the 1970s, the European Economic Community (EEC), now the European Union, issued a series of draft directives on the harmonization of company law throughout the member states. The Draft Fifth Directive (1972) proposed that all large companies in the EEC should adopt the two-tier board form of governance, with both executive and supervisory boards. In other words, the two-tier board form of governance practised in Germany and Holland, would replace the British model of the unitary board, in which both executive and outside directors oversee management and are responsible for seeing that the business is being well run and run in the right direction. In the two-tier form of governance, companies have two distinct boards, with no common membership. The upper, supervisory board monitors and oversees the work of the executive or management board, which runs the business. The supervisory board has the power to hire and fire the members of the executive board. Moreover, in addition to the separation of powers, the draft directive included employee representatives on the supervisory board. In the German supervisory board, one half of the members represent the shareholders. The other half are chosen under the co-determination laws through the employees’ trades’ union processes. This reflects the German belief in co-determination, in which companies are seen as social partnerships between capital and labour. The UK’s response was a Committee chaired by Sir Alan Bullock (later Lord Bullock), the renowned historian and Master of Saint Catherine’s College, Oxford. His report – Industrial Democracy (1977) – and its research papers (1976) were the first serious corporate governance study in Britain, although the phrase ‘corporate governance’ was not then in use. The Committee proposed that the British unitary board be maintained, but that some employee directors be added to the board to represent worker interests. The Bullock proposals were not well received in Britain’s boardrooms. The unitary board was seen, at least by directors, as a viable system of corporate governance. Workers had no place in the boardroom, they felt. A gradual move towards industrial democracy through participation below board level was preferable. Proponents of industrial democracy still argue that governing a major company requires an informal partnership between labour and capital, so employees should participate in corporate governance. Maybe an extension of the Shareholder Senate idea, suggested in a recent blog, called a Stakeholder Senate could provide another forum to inform, liaise with, and influence the board. On Friday 28 September 2012, fellow blogger Christine Mallin and I were on High Table at Clare, the Cambridge college founded in 1326. We were there to celebrate the twentieth anniversary of the refereed research journal Corporate Governance – an International Review. The current editor1, William Judge (Old Dominion University, Virginia) recognizing the high standing of the journal in academic circles for its rigour, expressed the hope that in the future corporate governance research could become more relevant to the policies and practice of the subject. Chris Mallin (Norwich Business School, University of East Anglia), who was editor from 2001 to 2007, described the heavy workload involved in editing a refereed journal, the challenge to meet deadlines, and the important contribution of referees. Having been the founder-editor in 1993, I told stories of the early years. The genesis of the journal had come many years earlier. In the 1970’s audit committees of independent outside directors had become popular in the United States, not least as a hedge against potential litigants, who eyed auditors’ insurance-backed ‘deep pockets’ for damages. In 1978, Deloittes in London had asked me to consider the relevance of audit committees to the UK. I discovered that, although in principle they might be a good idea, in practice they would not work in Britain because the concept of independence among non-executive directors was unknown. The resultant report was published as The Independent Director2.My interest in boards and directors had been kindled. But that spark was fanned by my experiences as Director of the Oxford Centre for Management Studies, a company limited by guarantee, whose governing body consisted of an equal number of heads of Oxford colleges and leaders of British business. I was astounded by the incredible behaviour of some members, who wielded power, with prejudice and passion. This was not the rational decision-making or analytical management theory we were teaching in the management centre. I realised that governance was different from management. It was about power. The opportunity to explore the subject came with a subsequent five year research fellowship at Nuffield College, Oxford. I titled the resultant book Corporate Governance3, but wondered about that phrase ‘corporate governance’; after all I had called the trust set up to fund the research the Corporate Policy Group. My worries were not resolved when I sat next to a visitor at High Table in Nuffield, whom I learned later was a professor of ancient English. Commenting, rather stupidly, that I had just written a book, he asked the title. “Corporate Governance”, I said. “You mean corporate government?” he queried. “No,” I replied, “its corporate governance. I looked the word up.” “My dear fellow,” he said, “governance, good gracious, governance, that word has not been used since the time of Chaucer.” It turned out that was not strictly true, but I did lose some confidence. Subsequently, Sir Adrian Cadbury was gracious enough to say that the book had introduced him to the phrase, which he used for his seminal report4, which, of course, was the forerunner of corporate governance codes around the world. The Oxford publisher Blackwells then approached me to edit an academic journal on the subject. The first edition of Corporate Governance – an International Review was published in January, 1993. Members of the distinguished editorial board included Adrian Cadbury and other authors who would make major contributions to the subject including Thomas Clarke, Philip Cochran, Ian Hay Davison, Ada Demb, Charles Handy, Jay Lorsch, Fred Neubauer, Bernard Taylor, and Steven Wartick. On a less anecdotal note, I hoped that in the future, Corporate Governance – an International Review could become a conduit to link today’s parallel universes of corporate governance research and corporate governance practice. I concluded with thanks and best wishes for every success to the publishers, subscribers, editors, members of the editorial board, reviewers, and, of course, the contributors, for the next twenty years. A great deal has been written about the cause and effect of the nuclear power station disaster at Fukushima Daiichi, which followed the Japanese tsunami and earthquake. No doubt more will be said in the future. But relatively little attention has been paid to the governance of the company behind the Fukushima plant. This case and commentary look at some aspects of the governance of the Tokyo Electric Power Company (TEPCO). 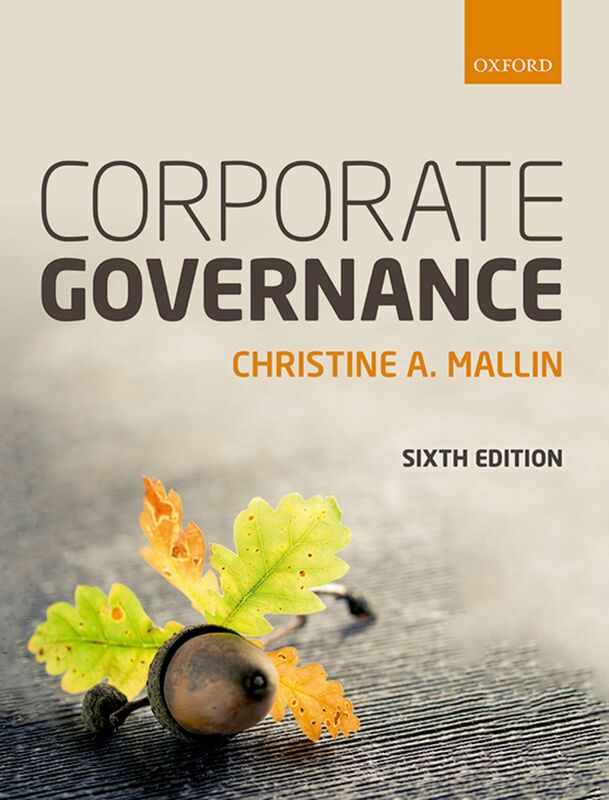 The material comes from the second edition of Corporate Governance – principles, policies and practices due in 2012. In an unlikely outburst, Naoto Kan, the Japanese prime minister, shouted “What the hell is going on?” to executives of the Tokyo Electric Power Company (TEPCO) following Japan’s worst nuclear crisis at the Fukushima Daiichi nuclear power plant, after the tsunami and earthquake on 11 March 2011. Were the directors or the corporate governance systems and procedures at fault? But behind the reassuring corporate governance explanations on the TEPCO web site lay a different reality. The company’s opaque handling of the situation at the stricken plant was widely criticized. The extent of the danger was minimized and the full extent of the damage only gradually became apparent, as the risk severity level was gradually increased to rank alongside Chernobyl as a most severe nuclear accident. The effects in Japan included damaged to fishing and agriculture through radio-activity in sea and soil, disruption in manufacturing as power supplies were rationed, and longer-term strategic concerns about the future of nuclear power generation. Around the world, the effects included slow-downs in production as supplies of parts from Japan dried up, concerns about the safety of Japanese produce, and serious questioning about the safety and strategic future of nuclear power. TEPCO’s handling of the incident exposed failings in its risk management systems. The company had a history of safety violations: in 2002, it falsified safety test records and in 2007, following an earthquake, its Niigata nuclear plant had a fire and a leak of radioactive water, which were concealed. In fact the board was dominated by inside directors, qualified by their seniority within the company. Out of the 20 directors, 18 were insiders, whilst of the two nominally outside directors one of them, Tomijirou Morita, was chairman of Dai-Ichi Life Insurance, which was connected financially with TEPCO. In 2008, Tsunehisa Katsumata, the company president at the time of the 2007 problem, was elevated to chairman, being replaced by Masataka Shimizu, another career-long TEPCO employee. TEPCO had never appointed a head from outside the company. At first glance, the web site seems to reflect a company strongly committed to sound corporate governance: ‘corporate governance policies and practices a primary issue’, ‘interactive communication with our valued stakeholders’, ‘corporate governance a critical task’. So how to account for the discrepancies between the company’s alleged concern for corporate governance and the catastrophic failure of its Fukushima reactors? Some clues can be found in the web site explanation of the company’s corporate governance. Notice the emphasis on ‘management’: ‘corporate governance is a primary management issue,’ ‘corporate governance (is) a critical task for management.’ The directors seem to make no distinction between management and governance. Nor is that surprising, because they are the same people. 18 of the directors are executives at the top of the management hierarchy, and one of the two alleged outside directors is not independent. The classical model of Japanese corporations and their keiretsu groups reflects the social cohesion within Japanese society, emphasising unity throughout the organization, non-adversarial relationships, lifetime employment, enterprise unions, personnel policies encouraging commitment, initiation into the corporate family, decision-making by consensus, cross-functional training, and with promotion based on loyalty and social compatibility as well as performance. In the classical Japanese model, boards of directors tend to be large and are, in effect, the top layers of the management pyramid. People speak of being ‘promoted to the board’. The tendency for managers to progress through an organization on tenure rather than performance means that the mediocre can reach board level. A few of the directors might have served with associated companies, others might have been appointed to the company’s ranks on retirement, or even from amongst the industry’s government regulators (known as a amakaduri or “descent from heaven”). But independent non-executive directors, in the Western sense, would be unusual, although the proportion is increasing. Many Japanese do not see the need for such intervention “from the outside.” Indeed, they have difficulty in understanding how outside directors operate. “How can outsiders possibly know enough about the company to make a contribution,” they question, “when the other directors have spent their lives working for the company? How can an outsider be sensitive to the corporate culture? They might even damage the harmony of the group.” A study by the Japanese Independent Directors Network, in November 2010, showed that of all the companies on the Nikkei 500 index, outside directors made up 13.5% of the board, women 0.9% and non- Japanese 0.17%. TEPCO fits this model perfectly. However, the classical model of Japanese corporate governance is coming under pressure. With the Japanese economy facing stagnation in the 1990s, traditional approaches to corporate governance were questioned. A corporate governance debate developed and the stakeholder, rather than shareholder, orientated corporate governance model came under scrutiny. Globalisation of markets and finance put further pressure on some companies. The paternalistic relationship between company and lifetime ‘salary-man’ slowly began to crumble. Some companies came under pressure from institutional investors abroad. Company laws were redrafted to permit a more US style of corporate governance. But few firms have yet embraced them. Signs of movement included calls in 2008 by eight international investment funds for greater shareholder democracy, and a report from the Japanese Council for Economic and Fiscal Policy to the prime minister proposing that anti-take over defences be discouraged and the take-over of Japanese firms be made easier. Perhaps the TEPCO experience will encourage further moves towards enhanced corporate governance.